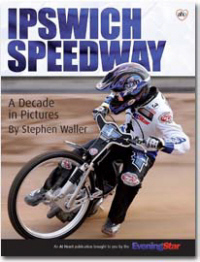 Ipswich track photographer Stephen Waller has teamed up with the Evening Star newspaper to produce a most-interesting photography book. "Ipswich Speedway - A Decade in Pictures" profiles the best of Stephen's photographs from Foxhall (and other tracks) since 1998. The book is split neatly into eleven sections, each covering a different year in the Witches' history. The final league table, Ipswich averages and that year's team photograph are included alongside Stephen's best work from that season. The book gets off to a cracking start by transporting us back to the 1998 season in which the Witches were simply unstoppable. Their spearhead of Tony Rickardsson, Chris Louis,. Tomasz Gollob and Scott Nicholls ensured they won home and away from March until October. Waller was on hand to capture the celebrations in the town centre when the club were rewarded with a civic reception. The book also revives memories of some very strange practices around that season. Do you remember the helmet colours featuring club logos or the "red/blue" or "white/yellow" number patches used on the back of the kevlars? There is a danger that a book of this nature could become repetitive and boring. Waller manages to avoid that trap by selecting a wide-range of different photographs. These aren't simply snaps of four guys hitting the first bend, there are candid shots, scenes of ecstatic celebration, a few cheesy press shots and some quite magnificent crash sequences. None more so than Robert Miskowiak's somersault over the fence at Oxford in 2005, though Daniel King's purler in 2006 comes close. There are some real gems hidden away in the book, the section on Jeremy Doncaster's farewell meeting being a particular highlight. There are also pictures of some of the real characters associated with Ipswich over the years - Tim Woodward, Lol Hare, Tony Davey and 'Tiger' Louis himself all feature. The book comes right up to date by including pictures from the early 2008 action and featuring short profiles of this season's Witches. The latter certainly being a brave move given how quickly such a feature could become dated. This is simply a highly impressive publication. The glossy paper used throughout allows the pictures to be reproduced fantastically well, the quality is genuinely comparable with holding a photograph in your hand. No Ipswich fan should be without this, fans of other clubs will undoubtedly enjoy it and even non-speedway fans would get a kick out of it.